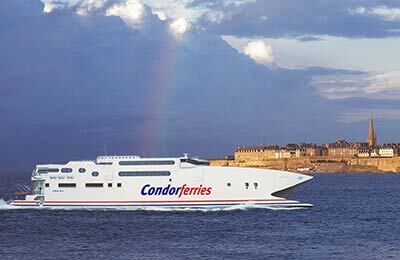 Guernsey ferry port, (St Peter Port) offers ferry crossings to Jersey, Portsmouth, Poole, St Malo. Guernsey ferry port, or St Peter Port is located on the island of Guernsey. Easily accessible, there are daily sailings to England, France and Jersey from Guernsey port. Port address: White Rock, St Peter Port, GY1 2LL, Guernsey. Located on the east coast of the island, it is easy to reach the port from all over. From St.Julians Avenue continue straight over roundabout and follow signs to ferry port. The nearest bus stop is located in the town centre, which is a 5 minute walk away. For more information on the bus services available in Guernsey please visit Buses.gg, the website for bus services on Guernsey. There is a café at the ferry terminal, open for all ferry departures. A shop sells snacks and souvenirs. A Bureau de Change facility is available inside the terminal building. Disabled toilets are located inside the terminal building and wheelchairs can be assisted onboard the ferry from the terminal. A tourist information centre is located a 5 minute walk from the ferry port.